Place water, sugar, coffee and salt into a pot and bring to a boil. Remove from heat and allow about 10 minutes of cooling. Break up pieces of chocolate and place into a food processor fitted with the steel blade. Pulse machine to further break up chocolate. ONLY PULSE! Pour water mixture through feed tube of processor while machine is running. Be careful. Pour chocolate mixture into a separate container for overnight cooling in the refrigerator. The next day, freeze mixture in an ice cream maker. Place sorbet into the freezer for further chilling. FOLKS, we are counting the days until the debut of our long-awaited cookbook arrives. Keep your eyes on your email as we will throw a book signing bash in November. Date to be determined. For our friends out-of-state or out-of-area, we will have an online store at highscafeandstore.com where you can purchase as many books as you want and we will ship them to you! Thank you for your patience in this endeavor. On behalf of our team, Denise and I thank you for your support and patronage. In a preheated cast iron skillet, add about 1/4 C olive oil. Brown meat in batches and season generously with salt and cracked pepper. Remove to a paper towel-lined plate. Wipe out skillet. Add another 1/4 C of olive oil. Add carrots, celery, onions and garlic. Again, season generously with salt and cracked pepper. Don’t over stir! Allow some browning of the veggies. Also, water will be extracted from the veggies from the addition of the salt. Continue to sauté veggies until skillet becomes “dryish” again. Add tomato paste. Mix in well. An additional amount of oil may be needed. Continue to sauté as a deep red color develops. Some sticking is good. Just watch your heat. No need to rush this. Depth of flavor is forming. Add 1 C of wine to the veggie mix. Raise heat and get a nice bubble going. Reduce the wine until thickened. You should be able to draw a line across the bottom of the skillet and it should hold. See photo. Place veggies, drippings and reserved meat into a crock pot. Add beef stock, remaining 1 C of red wine, thyme, cloves and bay leaves. Turn on high and cover. While that is simmering, sauté mushrooms in the same skillet with some olive oil, salt, cracked pepper and a pinch of dried thyme. You may need to add additional oil as the mushrooms soak it up! Develop a nice golden color. Reserve to a bowl. Fill a large pot 2/3 full with water. Bring to a boil. Carefully add 1t of salt and 1t of baking soda. It will bubble, be careful. Add potato pieces. Again be careful not to splash hot water on yourself! I used a sieve to gently lower them into the water. Cook until potatoes are tender. Drain in a colander. The potatoes will have rough edges compliments of the baking soda. Reserve. Continue to simmer the meat until tender. Several hours will be required. Stir together softened butter and flour until a smooth paste forms. Add this to the stew. Mix in well. Add reserved potatoes, peas and mushrooms. Allow to heat thoroughly. Adjust seasoning with more salt and pepper, if needed. Ladle stew into a warmed bowl and garnish with some chopped parsley. A good loaf of bread and a better bottle of red wine is all that is needed. Blog night is always a good excuse to have friends over. A blog follower requested a recipe that I thought was online. Since I was mistaken, I let her know that I would get the recipe online asap. Fortunately, friends were willing to sample the soup and an evening was scheduled. We have met so many wonderful folks here in Santa Fe. It is always a pleasure to welcome them into our home. We provided the food, they provided the libations. Martinis, wine and craft beer got the evening going. In addition to the lentil/chorizo soup, we began the evening with a warm spinach/artichoke dip (recipe from “The Plaid Goat” days), an “end of the summer caprese”, and a quinoa, arugula and butternut squash salad. We concluded the evening with some lemon curd, berries and gluten-free almond cookies. A recent freeze here required the picking of all tomato plants in the garden. So, all guests were required to leave with a bag full of garden fresh tomatoes! Here’s to more gatherings with dear friends. In a large preheated soup pot, add olive oil. Add onion, celery, carrots and garlic. Spritz vegetable mix with salt and pepper. Sauté over medium heat until vegetables soften and meld. You may need to add some additional olive oil. Add tomato paste. Continue to sauté until vegetables and paste begin to stick to the bottom of the pan. Increase heat and add red wine. Reduce red wine until almost completely evaporated. You should draw a line on the bottom of the pan and it should stay dry. See photo. Add crushed tomatoes. Add bay leaves, cloves, red pepper flakes, thyme and salt. Mix well. Add lentils and stock. Bring soup to a boil. Lower heat and simmer until lentils have softened. At this point, add chorizo and simmer an additional 15-20 minutes. I prepared the soup a couple of days before I served it. I chilled the soup in the refrigerator, uncovered, overnight. The next day, I covered the soup for an additional day of storage. Before service, I reheated and added the chorizo. The soup will develop more flavor when it has a chance to rest in the refrigerator. The soup can be made several days out. Add the chorizo just prior to service. Aurelia’s Spanish Chorizo (available online and at HEB) is delicious. I ended up using a Chorizo purchased at Whole Foods. Perfectly fine. For service, I toasted up a baguette. Brush baguette slices with olive oil and bake until crisp. Also, I added some chopped parsley and parmesan cheese to top. The soup freezes well too. Would not freeze with chorizo. It’s that time of year again! Our annual musicale, which brings together musicians from all over the state, is Monday July 24, 7 PM. 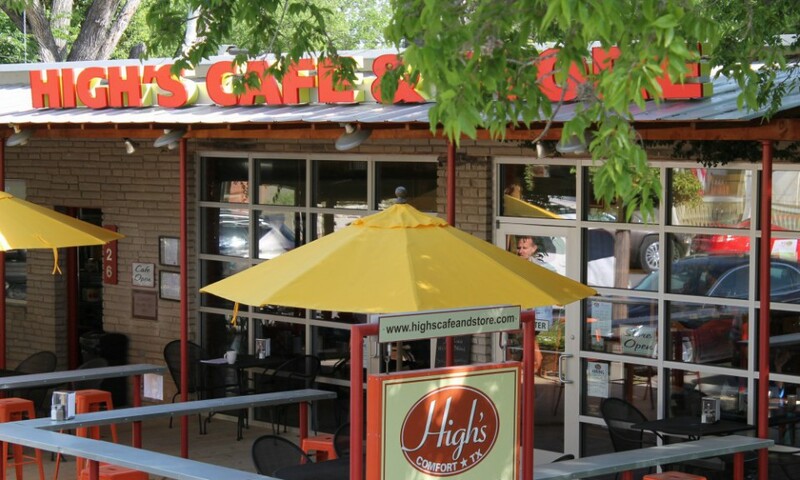 Tickets can be purchased at High’s Cafe & Store during normal business hours. We are unable to process a credit card transaction. Checks made payable to The Comfort Table or cash will be accepted for payment. Generous underwriting allows for 100% of the ticket price to go to the table and pantry. Following the concert, the good feelings continue with wine and nosh at High’s. The after party is a great time to greet and thank the various performers. This year, a string group from The Austin Symphony will join 22 professional singers, a pianist, guitarist, oboist, and bassist along with our word maestro Douglas Skrief from International Falls, Minnesota. Many audience members have come year after year for the gathering. In the intimate venue of Spinelli’s (former Gaddis Methodist Church), you literally are surrounded in sound. Allow the music and the poetry to transport you to a “better place”. If you have never been, YOU ARE MISSING SOMETHING TRULY SPECIAL. Get your tickets today. The event is always sold out. Only 175 seats are available. ROAD TRIP! Off we went with Jerry for a hike in the Santa Fe National Forest. Located halfway up the road to the ski basin is a great hiking trail. Borrego Trail is the perfect walk in the woods. I’ve never seen Jerry happier. Other happy dogs along the way offered testimony to the lovely scenery. At times, an awesome quietness surrounded you and at other times nature spoke. There is something about walking in the woods that realigns your psyche. Once we descended the mountain, we were greeted by a refreshing stream – a perfect location for a picnic. Next time. We watered Jerry and headed back. The trail makes a triangle. However, we missed a turn and continued up a different path that would have taken us wildly off course. Luckily, three mountain cyclists stopped and reoriented us. Thank God for them. Another watering for Jerry at the stream and we headed toward the car. This was a great outing and I look forward to sharing it with family and friends. Doug, bring your hiking boots. The garden project is coming along. Abundant sunshine, watering, pruning and music have encouraged our veggies and flowers to grow! Lettuces and herbs were shared the other evening with friends along with a celebratory toast to Mother Earth. A local artisan created the sacred spiral which encourages the garden to grow from the inside out. A strong core results in abundant growth. I hope you have enjoyed watching the progression of the garden. From construction of raised beds to dressing of the greens, this effort has been a delight. Brine chicken breasts in salted ice-cold water for about two hours prior to cooking. Rinse and pat dry. Place chicken on a foil-lined baking sheet that has been sprayed with cooking spray. Drizzle olive oil over chicken. Spritz with salt, cracked pepper and dried oregano. Place chicken into a preheated 425 degree oven for 15 minutes. Remove chicken and place sliced lemons on top. Place back into oven with broiler on. Place rack about 10 inches from heat source. Keep an eye on them and broil for about 10-15 minutes. Make sure to rotate baking sheet for even cooking. They are done when the thickest part of the breast feels firm to the touch. Remove and let chicken rest for about 10 minutes before slicing. Cook quinoa according to instructions on package. 1/4 C dry measure is a good serving size per person. Add chopped parsley (LOTS), cherub tomatoes, mint, basil, toasted walnuts, lemon juice, EVOO, S & P. Combine and adjust seasonings. Great for leftovers the next day or after. For yogurt salad, combine diced cucumber, green onion, lemon zest, red chili flakes and salt with whole milk Greek yogurt. Slice snap peas on the diagonal. Combine with slivers of radish, S & P, a splash of toasted sesame oil and a spritz of rice wine vinegar. Drizzle olive oil on some rustic bread slices and toast in a toaster oven until “crispy chewy”. This meal stores well in the fridge for leftovers the next day.